This study concerns with the A Semantic Analysis of Michael Learns to Rock's (MLTR) Songs. 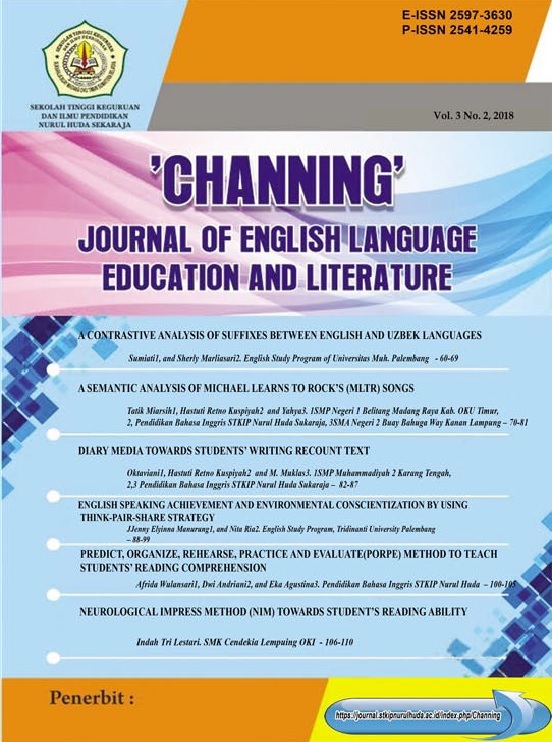 This study proposes problems are 1) what are the lexical meanings in the lyrics of Michael Learns to Rock's (MLTR) songs?, 2)What are the contextual meanings in the lyrics of Michael Learns to Rock's (MLTR)? The purpose of this study is to find out the lexical and contextual meaning that is used by Michael Learns to Rock's song lyrics. Therefore, this analysis used the descriptive method because it is to describe the lexical and contextual meaning in MLTR's song lyrics. There are five songs lyrics. Then, in this study, the procedure used in the data collection are (1) reading and comprehending the lyrics; (2) identifying the words used in the lyrics; (3) Marking and finding the meaning of the words found in the lyrics; (4) concluding the data analysis. Based on the finding, the writers found two kinds of meanings used in Michael Learns to Rock's Songs lyrics. They are lexical and contextual meaning used in the lyrics of Michael Learns to Rock's songs. They are 1) Paint My Love consists of 3 words; years, crazy and paint. 2) Sleeping Child consists of 4 words; Milky Way, paradise, cover, and hold. 3) That's Why (You go away) consists of 4 words; Left, thing, man and way. 4) Love will never Lie consists of 4 words; Run-down, road, lie and hear. 5) 25 Minutes consists of 4 words; Girl, done, hungry, and hear. Adisutrisno, Wagiman.(2008). Semantics an Introduction to the Basic Concepts. Andi. Yogyakarta. Creswell, John W.(2014). Research design: qualitative, quantitative, and mixed methods approach 4th ed. SAGE. United States of America. Crystal, David.(2008). “A Dictionary of Linguistics and Phonetics Sixth Edition” Blackwell Publishing. Australia. Denscombe, Martyn.(2010). The Good Research Guide fourth edition. Mc Graw Hill, Open University Press. Hornby, A S. (2010). Oxford Advanced Learner’s Dictionary new 8th edition. Oxford University Press. New York. Klarer, Mario.(2004). An Introduction to Literary Studies 2nd Edition. Routledge. London. Sopa, Maya. 2015. An Analysis of Moral Values in Maher Zein’s Selected Song Lyrics. Thesis Department of English Faculty of CulturalStudies. University of Sumatera Utara. Medan.Wijayanto, Tri Kusuma.(2013). An Analysis of Theme In Michael Learns to Rock’s Song Lyrics. Department of English Education Faculty of Teacher Training And Education University of Muria Kudus. Kudus. Yule, George. (2010). The Study of Language Fourth Edition. New York: Cambridge University Press. MLTR. (1996). Paint My love Album. (Online). (http//:www.mltr.dk). Accessed on Monday. 24th of April 2017. MLTR. (2016). Discography. (Online). (http//:www.mltr.dk). Accessed on Monday. 24th of April 2017. Webster. (2017). Song. (Online). http://www.merriawebster.com/dictionary/song).